9:50 – Linda Austin (movement), Reed Wallsmith (sax). 11:30 – Improvised Round Robin Duets with: Holland Andrews (voice/clarinet), Mike Gamble (guitar), Farnell Newton (trumpet), Edna Vazquez (voice), Doug Theriault (electronics), Joe Cunningham (tenor sax), Dana Reason (piano), Luke Wyland (keyboards), Tim DuRoche (drums), Lars Campbell (trombone), Rich Halley (tenor sax), Reed Wallsmith (alto sax). As a chamber music ensemble the saxophone quartet has a surprisingly long pedigree. The first work for it was written in 1857, less than twenty years after Adolphe Sax invented it, a Saxophone Quartette Club was founded in New York in 1879, and by 1896 a California Saxophone Quartet was on tour. While the modern saxophone quartet is now most likely to be associated with the jazz tradition, the standard ensemble of soprano, alto, tenor and baritone saxophones was originally developed to play music in the Western art music tradition. Thus in a sense this recording represents a return to roots of sorts. 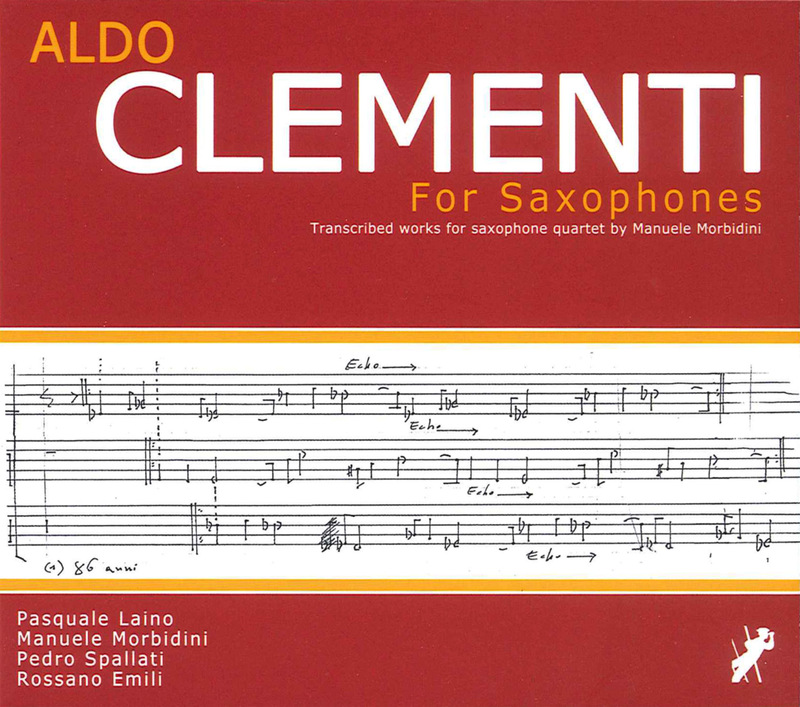 Seven of the nine pieces by Italian composer Aldo Clementi collected here are scored for the standard saxophone quartet, with Pasquale Laino, Manuele Morbidini, Pedo Spallati and Rossano Emili on soprano, alto, tenor and baritone respectively. On the remaining two tracks Laino switches to alto and Emili to tenor. Like many of the earliest works in the saxophone quartet repertoire, these are transcriptions of compositions originally written for other instruments. Clementi (1925-2011) was an Italian postwar avant-garde composer. Along with many other European postwar composers he took the work of Webern as a starting point, and developed his art through attendance at the Darmstadt summer sessions and work at RAI’s Studio di Fonologia Musicale. A personal acquaintance with Bruno Maderna was also decisive for him, as was the influence of the spontaneous gesturalism of the painters associated with Art Informel, Europe’s counterpart of American Abstract Expressionism. Morbidini, Clementi’s student, produced the transcriptions recorded here with Clementi’s input, although the latter sadly did not live to hear the completed project. The pieces Morbidini chose are late works from the period 1997-2005. All of them seem to embody, to a greater or lesser extent, Clementi’s characteristic counterpoint of cyclical canons made up of shorter phrases. The very first piece, the relatively brief Canone, exemplifies this kind of construction. Four independent voices weave their lines into a polyphony deeply flavored by an astringent Modernist dissonance. Similar harmonic vocabularies and phrase structures imbue Momento, which hints at times of a minor modality, and Von Himmel Hoch, whose melodic fragments trace a slowly rising and falling course. Blues 1 and Blues 2, originally composed for piano, are kaleidoscopic settings of shards of melodies taken from various pieces by Thelonious Monk. Although the works presented here weren’t originally written for saxophone quartet, the format is remarkable for bringing out Clementi’s contrapuntalism with great clarity. For Saxophones thus serves as an intriguing introduction to this composer. 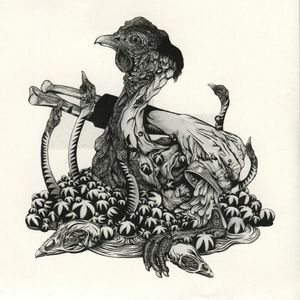 Cardiff-based Ian Watson is a visual artist of the “deceptively grotesque” (think a mash-up between R. Crumb, M.C. Escher and Hieronymus Bosch) and his album title is a mash-up of three, four-track suites previously released in “near zero editions,” according to the label. He is sometimes known as Swefn. He wields “home-made electronic instruments and off the shelf effects and applications” to create weirdly beguiling textures. On the first, the “Terrestrials” seem decidedly off world, drifting in dark but pleasant nothingness, coo´ed at by quasars, occasionally ruffled by some wayward static. Benevolently, the universe blinks at these strangers. Far from the madding crowd of New Agey spaciness, it´s one of the most intriguing sci-fi excursions I´ve heard in a long time, accessible and challenging in just the right balance. “Gone Tropic” might well be mistaken for a deconstruction of “Terrestrials,” its boops magnified and its laser beams more bona fide, less video game. Watson stews it into something very thick and hot. More likely the tropics of Mercury than our own equator. Its four movements successively deplete each sound of its lubricant until nothing but a strident grind shedding flakes of rust remains. “Some Pretty Fancy Animals” is the shortest quartet of the three, just over ten minutes all told. The piece exists in an echo chamber, plummy notes cranked out of a muffled jack-in-the-box bumping into dubbed out vinyl run off, its tines grown into huge steel beams clashing on the final, stuttering versioning. It is apposite that Watson once wrote “only surface noise is real”. Dense and luridly luminous – a white dwarf of enigmatic, nebulous ambient.